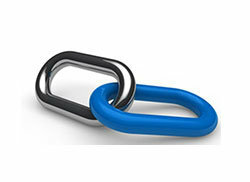 Links to helpful BMO contact and benefit information. 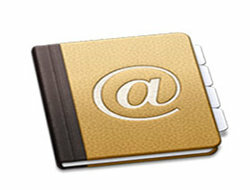 Directory of BMO Pensioner members. Access granted to members only. 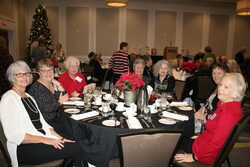 There are pictures from the final lunch of the season for Southwestern Ontario. It was held at the Arden Park Hotel (Best Western ) in Stratford April 15th and we had one of the best turnouts of the year. The fellowship was great and the food was plentiful and excellent. We will begin again in the fall so take care and have a great summer everybody. Thanks again to Ken Summers and his photo wizardry. He always manages to get great photos for us. To see all the pictures, please go to the Photo Gallery. We were saddened to hear of the passing of Burt McConnell. 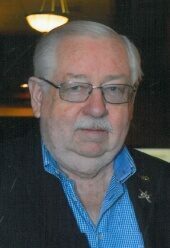 Burt was our Regional Representative for the Eastern Townships in Quebec and contributed to the success of the CyberPensioners. He was a supportive colleague of many in the Bank across the country and for some of us a very special friend. He will be sorely missed. 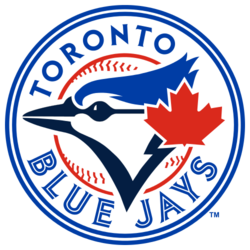 We are pleased to announce the BMO offers for the 2019 Toronto Blue Jays home games. Visit the TICKET OFFERS page to purchase tickets. 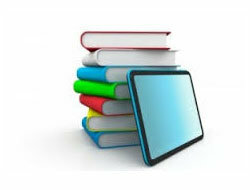 Spring is here and it is time to catch up! Turn right on Old Vernon Road at Reids Corner (If approaching from the north turn left). Turn left on Acland Road then right on Penno Road and follow to the end. Dues are due for 2019 at $10.00 per pensioner or $15.00 for a couple. 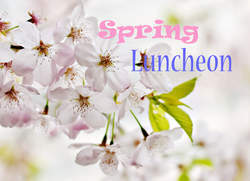 Lunch costs – Attendees are requested to contribute $15.00 each to defray the cost of lunch. Bring your loonies and toonies for the 50/50 draw. Thanks to Marianne Eveshuk for the information. The Annual BMO Bank of Montreal Pensioned Employee Luncheon was held on Friday November 20th, 2018 at the Coast Capri Hotel, Kelowna, BC. The event was well attended, with around 100 pensioners catching up with friends and colleagues, sharing a few laughs and enjoying a delicious lunch. Photos by Denis Knox, Marianne Evashuk, Linda Engels. Please go to the PHOTO GALLERY to see all the pictures. Thanks to Marianne Evashuk for sharing. AT LAST THE NORTH WIND HATH BLOWN AND WE HAVE SEEN SNOW IN OUR YARDS, SPRING HAS ARRIVED AND THINGS ARE LOOKING UP!!! SO GET YOUR FAVORITE TRANSPORTATION TOGETHER  AND JOIN US AT THE PLACE WHERE EVERYBODY KNOWS YOUR NAME - SAMZ NEIGHBOURHOOD PUB IN BEAUTIFUL DOWNTOWN PORT COQUITLAM, on TUESDAY, MAY 7TH - 11:30 TO 2:30. EVERYONE IS WELCOME, GOOD FOOD – REASONABLE PRICES, SAVE A SEAT. Thanks Ron Gillies for the information. CAN YOU ANSWER YES TO THE QUESTIONS (on the image)? 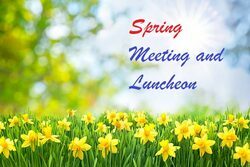 On Tuesday March 12th/19 ,20 members of the group met at the Best Western Hotel in Brantford Ontario for it's 4th winter monthly lunch date. It was a nice sunny day to travel with a hint of spring in the air. The location is closer to the Hamilton/Burlington area and we got a great representation from that area. The restaurant offers an excellent buffet and all in attendance had an enjoyable lunch and a good time reminiscing with each other. A special thank you to Ken Summers for his photography wizardry and for compiling the photos and names. Jim Martin stepped in as emcee for Chuck Joynt, the SW Ontario Cyberpensioner's representative who luckily is spending some vacation time in southeast Florida. Please go to the Photo Gallery to view the photos. Thanks to Ken Summers for sharing. The Toronto Mixed Slo Pitch season will begin in late May, 2019. Slo Pitch is similar to baseball, except that your own team mate pitches the ball to you. Teams should have approximately 15 players to allow for absences. Pensioners are welcome to participate. 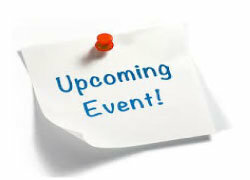 For more information and Registration information, see the Events Section. Thanks to Shelley Dolan and Dave Pennington for the information. Our new guest speaker will be Mr. Robert Manning. In the summer of 2017, Tottenham resident Robert Manning endured a five month trek up the continental divide of the Americas (Mexico to Alberta), and has two pairs of torn hiking shoes to prove it. Robert will describe how he accomplished this daunting 5500 kilometre trek.....he stated "The hardest part of the hike was to just keep going". A significant achievement by a special person. Thanks Gabby Winterstein, (Chair BMOFGPE Central Ontario Chapter) for sharing. For additional information, see Ticket Offers. January is over and we are all, no doubt, starting to look forward to those long sunny days and it is a good time to get a head start and register early for our annual Golf “Tournament” for pensioners and friends. The Texas Scramble format will be used again this year and you may enter as one, two, three players or as a foursome. Thanks Ron Gillies for sharing. The latest BC Lower Mainland Newsletter is now available. 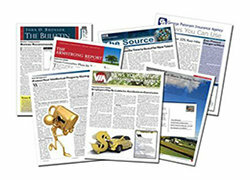 Go to the Association Newsletters webpage to read the latest issue. Thanks to Ron Gillies for sharing. 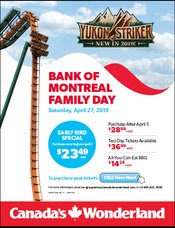 Bank of Montreal Family Day at Canada Wonderland is on Saturday, April 27, 2019. Purchase the tickets and enjoy your day. CLICK HERE to go to the "Ticket Offers" to purchase the tickets. Thanks Shelley Dolan for sharing. 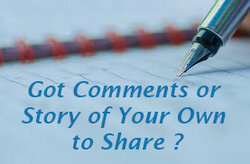 Letters to the Editor, articles, photos, stories and reports from our members have been an integral feature of our website over the years often stimulating feedback and follow-up responses. Quite naturally not everyone is comfortable with writing something for publication. But we do want to encourage our members to write to us so we thought it might be helpful to briefly look at the type of submissions that seem to strike a cord with our membership. 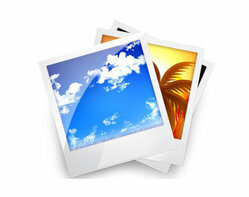 The most popular theme would be memories of life in the bank. Stories about guns in branches easily tops the list. Articles, stories or old photographs reminding us of past major events or launches of departments, programs and products, reorganizations, memorabilia or social events likewise have created interest. These have often been told with humour, sometimes of the "believe it or not" variety and clearly lasting memories. Photographs and reports of recent formal and informal lunches, both large and small have been increasing lately and seem to be especially popular. Should you require assistance or advice either contemplating or structuring a submission, Joan Mesic, our Senior Correspondent is more than willing to help. We have a number of suggestions for topics including: life as a consultant after retirement, moving with the bank, vault stories, branch renovations, the old cafeterias, dealing with difficult customers or a personal story. 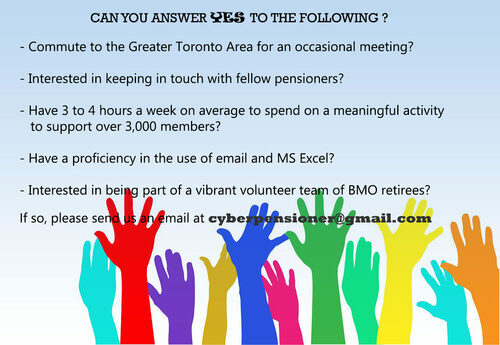 If you have ideas for articles or stories that you think would capture the attention of our members, please contact us at cyberpensioner@gmail.com. By the way banking trivia questions for our membership would also be welcome, but only if you know the answer! So let me kick it off with two quick questions that just might be familiar to those who worked in the bank during the 1970's. 1) Can anyone tell us the name of the security guard who, regardless of whether or not he knew them, very conscientiously checked the identity of anyone trying to gain entry to the old OSVP offices at 50 King Street West in Toronto, sometimes several times a day? 2) Which executive had a suit of armour in his office? Join the Cyber Pensioner Community.